My life has always been rich, and I have been strong and healthy enough to do what I want. However, at the end of 2015 something happened to completely change the way I view my life and my work – in an accident the tendons on my right shoulder were torn away from the bone. How it happened is not important, but for over six months I could barely move my arm and I could only find a few hours of bad sleep each night. My inability to function affected me deeply. During this same time two of my dearest friends died in very difficult circumstances. With much time to reflect, I promised myself that if I regained full use of my arm, I would change the way I lived my life and devote as much time as possible to doing what I want to do. I am lucky that one of Australia’s best shoulder surgeons works in my home city of Brisbane. Dr Fardoulis is renowned for rescuing the careers of many injured sporting personalities and his office walls are covered with memorabilia from them. Imagine my surprise when he said that he had looked at my website and he wondered if he could have one of my sculptures as part payment for my surgery. I know that the harsh work of carving such woods as Red Mallee for around 30 years has contributed to the wear on my joints, so I thought his idea was really appropriate. Some months after my surgery and when it was obvious he had succeeded in repairing my shoulder, I delivered one of my favourite Trees to his surgery. Dr Fardoulis is a perfect gentleman and he beamed with pleasure when I took it out of the box. Now my arm is working better than before the accident and I am doing work as good as I have ever done. So thank you Dr Fardoulis, I owe so much to you. In the coming pages I am going to describe how my creative life has changed. I have already written about the exhibition I had last year at Shin Gallery in Brisbane. It was a gentle way of easing my unfit body back into the daily task of sourcing and selecting wood, preparing it, putting it on the lathe and turning. What I most enjoyed was the return to my woodworking beginnings as a bowl turner. A bowl is a beautiful thing. It can be a purely functional object, or just an excuse for bringing out the best in a rare piece of wood. It can also be an object of contemplation and often such pieces make people react in ways they didn’t expect. For those few who instinctively understand, little explanation is needed. I don’t try to define whatever it is that causes people to react in this way because it is different for every person. My work was simply displayed and each piece spoke for itself. The exhibition at Shin gallery was deeply satisfying because, as any maker knows, it is easy for someone to say they like your work, but when they spend their hard-earned money to buy a piece they usually mean it. I sold nearly 40 bowls and most of them were at the higher prices. As a craftsman, I believe I need to stay in the market or my creativity will slowly and sadly decline. My exhibition ran for over a month and several times a week I demonstrated in the shade outside the gallery. It was a good chance to explain how I make my work. Woodturning is compelling to watch and some people who said they’d stay for “just a few minutes” ended up buying lunch at the café next door and sitting for hours to eat and chat with me while I worked. Others bought fresh coffee and cakes for me! I like this kind of engagement with people, particularly as it helped them appreciate the work in the gallery. They often asked me to come inside to tell them about certain pieces, and these were the pieces they often bought. Much as I enjoyed my time at Shin Gallery, at the same time something else was happening that has completely changed my motivation and the way I work. Telling this story will give me so much pleasure. For more than thirty years I have worked very hard at my chosen field of woodwork, but I have always supported this with other skills – writer, editor, curator, photographer, teacher, commentator, director, traveller and more. I love them all, particularly when they allow me to travel, but when my time is limited the first thing that suffers is usually my woodwork. I have now made a decision to refocus my energies on making the best work I can and everything else will only be used to support that. The reason why I have made this decision is because of my wonderful working relationship with Zina Burloiu. 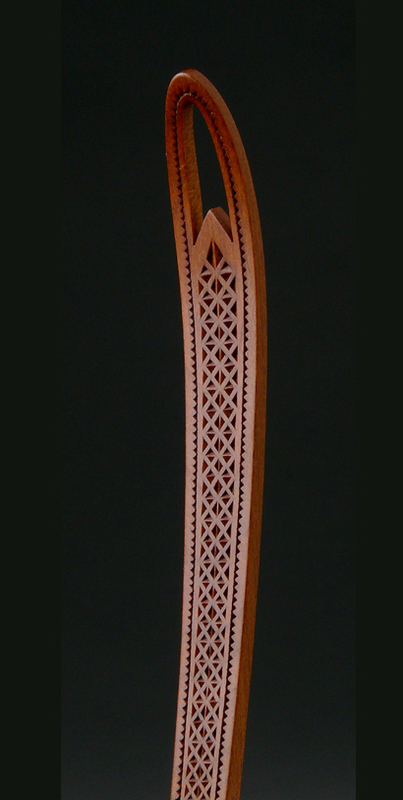 Zina works in Romania and has been a carver and sculptor for nearly thirty years. 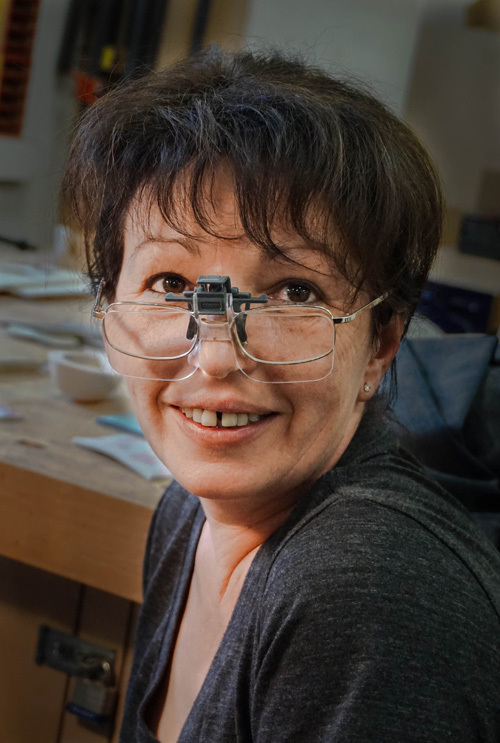 Zina is the most honoured traditional carver in Romania, but she is not afraid to challenge tradition. 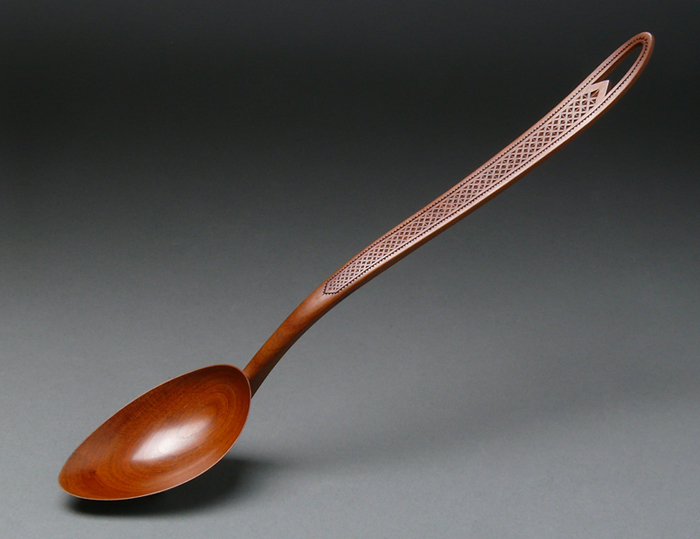 Her work is spoken of almost with reverence and she is known as one of the most accomplished spoon makers and chip carvers in the world. However, while her traditional pieces remain much in demand, Zina has much more to offer: she trained at art college as a sculptor, is a qualified and experienced engineer, a tool maker, a teacher and a linguist. Learning and speaking languages is something we both enjoy and it is rare for us to talk without switching languages several times. 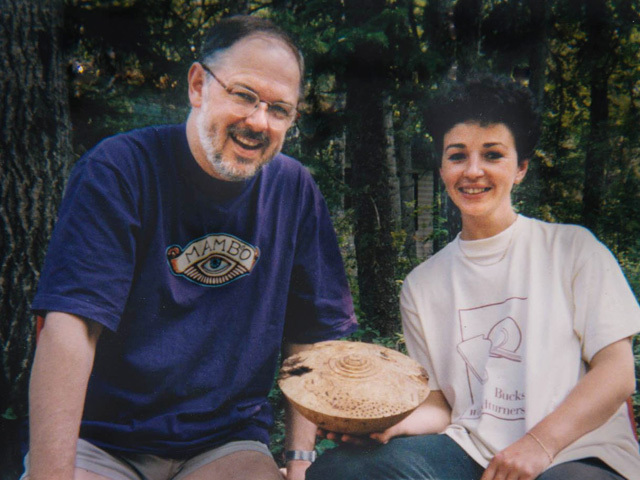 I first worked with Zina in 1998 at a collaborative woodworking event in Canada. We were both uncomfortable with what passed for collaboration there, so we quietly talked to each other about how we might work together. The piece we made was called Breaking Barriers, both because the event had the same name, but also because it was a breakthrough piece for both of us. I turned a solid cone of wood and Zina carved it with a broken spray of chips that flew as if centrifugally off the piece. We worked so well together and in a way that neither of us had done before. Even more important than what we made was the way that we communicated. It was as if we had known each other for years. In 1999 I wrote an article about her work that was published in Britain. I wrote, “I am sure we will see more of Zina”, but I could never have guessed how much we would work together in the future. We did meet at different times over the ensuing years, but over the last few years we have decided to breathe life back into that original spark. We have found ways to develop our creative friendship during artistic residencies in the USA, China and Australia, but we are very proud that some of our best collaborations happen while we are 15,000 km apart on opposite sides of the world. It is exciting work made possible by digital photography, mobile phone technology, face-to-face Internet conversations and planning sessions. Although it looks like we are working separately, at every stage there is real-time interaction when we fill each other with energy and ideas. Sometimes our collaborations seem very simple, but appearances are deceptive. As one example, I turned a simple bowl in camphor wood for Zina to enhance. Before we made this piece we had already worked together on many bowls and discussed proportion, shape, thickness and the carving qualities of different woods. We have found that the “face” Zina carves should present itself to the viewer without the need to pick up the bowl. In this case I turned a simple enclosed bowl so the upper area on the outside was angled towards the viewer. A simple bowl like that is a joy to see and we have done many more, but Zina has now taken our bowls in directions that neither of us anticipated. We often discuss the rims of bowls as they are an obvious place to put her carvings – rolled rims, flat rims, square rims, big rims, small rims and so on. I have sent Zina many bowls with a variety of rim shapes and some of her design ideas have been inspired. As we discuss our ideas I often recall a maxim that I have often used: “When an idea is not working, turn it on its head and see what it looks like.” To my absolute delight Zina did exactly that by carving the whole interior of a bowl and leaving the rim untouched! We called it Galaxie, which is Romanian, and it was the first in our series of bowls on a stellar theme. Naturally Zina and I have talked about combining our individual strengths and we came up with the idea of Spoonbowls. The idea was to create a piece that was neither a spoon nor a bowl, and yet was both. For one of these pieces I chose Huon pine, a unique Tasmanian species. First I cut out the basic shape, then mounted it on the lathe for turning. The whirling handle has a way of focusing your attention! Zina loves Huon pine and after I sent it to her we spent a lot of time talking about the right way to bring out the best in this amazing wood. Once we were in agreement she shaped the handle, laid out the design and started carving. We called this piece Crescendo and it is the subject of another story we have done for Drechsler magazine in Germany. Last year Zina and I were invited to make a piece for an exhibition by the American Association of Woodturners in Kansas City in June, 2017. The theme of the exhibition was The Sphere. We are both AAW members - I first joined in 1996 and have been a very active member over the years, and Zina has long been a turner as well as a carver. We have both exhibited in AAW exhibitions before. We agreed that this was an important exhibition for us, so we worked particularly hard to create a unique design. I wanted to produce a challenging piece of turning for her to work on, so I made a square-rimmed, off-set lidded box that required interesting technical solutions. It was partly hand-turned, always a challenge with an out-of-round piece, and partly turned with a captive tool in a cross-slide vice. I turned a hemispherical bowl in the centre and a matching lid to make a lidded container. To further meet the exhibition’s brief, I turned a small sphere of contrasting wood to fit inside the container. Once the turning was finished I cut back two sides and then sent it across the world to Zina. We talked online about the design she would carve and exchanged many sketches. Eventually we agreed on a design that told our story: two wood artists working on opposite sides of the world (two hemispheres), and one works in daylight while the other sleeps during the night (the stars come out). Zina carved the sphere inside with latitude and longitude lines to show that although we are so far apart, we work as if we are in the same workshop. We called the piece Spheres of Influence because we have been such a strong influence on each other over recent years. 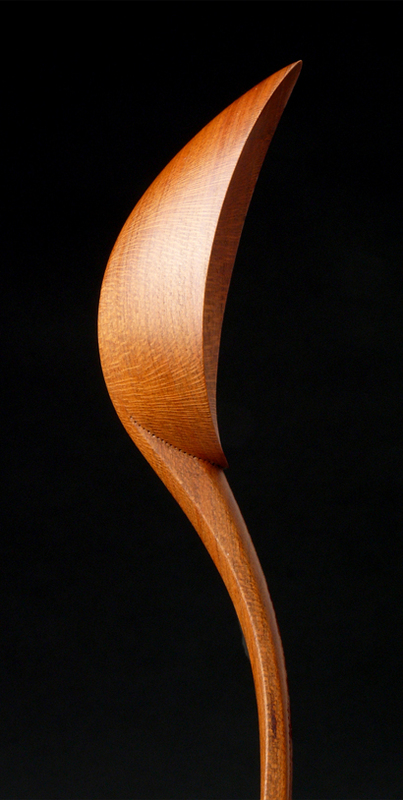 This piece will be the subject of a story in American Woodturner to be published in March, 2017. Since December we have written six stories together and we have enough material for years to come. So writing stories is another thing to inspire us and we hope it will inspire others to try to work this way. In March Zina and I will be giving a presentation at the Carl Malmsten School in Stockholm (http://carlmalmsten.se/skolor/carl-malmsten-furniture-studies/), then we will demonstrate at the opening of a new learning centre created by the Tormek Company in Lindesberg, Sweden. 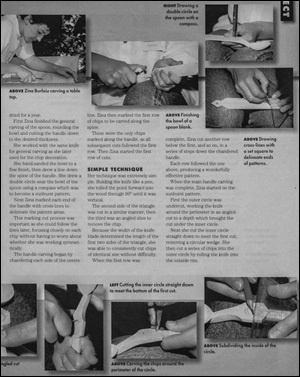 I am a devoted user of the products of this innovative manufacturer of sharpening systems (https://www.tormek.com). After Sweden, Zina and I travel to Boston where we have the opportunity to show our work at the Fuller Craft Museum, as well as give Sunday presentation and demonstrations to the public. We call this event Deep Collaboration because we want to emphasise that it is possible to create such an intense creative partnership, even across 20 years and half a world of distance. Visit "Terry's Travels" to view the photos from these events!